I know it’s been a while, but I had some things on my mind I would like to share. And I’m hoping I get some feedback from this. My plan is to focus on different areas and share my processes with you as I go through this “journey”. I’ve been working hard lately to cut down on the “stuff” around here- the main things I’m dealing with lately is clothing. Specially, the kids’ clothing. As I anticipate adding a third child’s wardrobe to an already full bedroom currently shared by two girls, I know something drastic needs to be done. 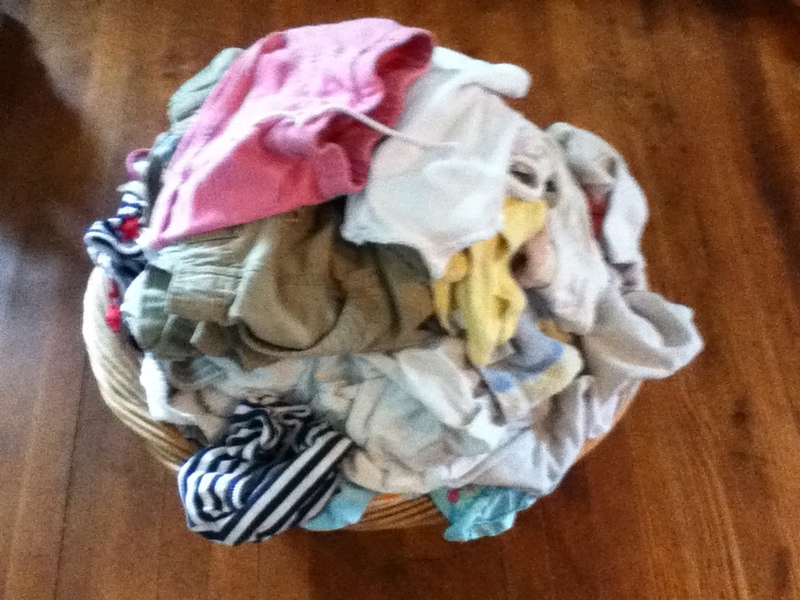 I know I need to do some major paring down, which I am pretty sure will help with my laundry dilemma (keeping up with putting it all away) as well as the finding and coordinating of clothing during dressing time issues. Another issue is the changing over of seasons/sizes. This tends to be a dreaded headache of a task for me that takes entirely too much time, usually spanning the course of several days to sometimes longer because it doesn’t fit in the space, I get distracted, or I just start pulling items out of the piles before I’m done organizing it. Not to mention the stress it causes me! I know it does not have to be that difficult. A solution can be found to make it less tedious. We have been blessed with clothing and various other items being given to us, as well as being bought at great prices, but I know now I’m at the point where I’m feeling burdened by too much and I need to take some action! I tend to be a person who is resourceful and I attach value to items, but I know there is a point where excess can steal peace and order. I highly value peace and order, but for me, I have found that it is something I need to “fight” for! Not to mention I have excess that could be blessing others, instead of being a hindrance to me! By the way, I think a lot of this has to do with a book I recently read by Jen Hatmaker. 7: An Experimental Mutiny Against Excess. That book has certainly given me a different perspective on the “stuff” I have in my life and what changes I could be making to make a difference in many ways. So I’ve decided to do an experiment. It’s something I thought of the other day, although I know it is not original. 🙂 I’m going through one size at a time (starting with the ones my girls are currently moving out of and into), pulling out the obvious/glaring excess and selling or donating those items. Then I’m going to do another sweep with what’s left and choose a limited number of items (I’m still doing some figuring on the specific numbers for each item) and then put those items alone in the bedroom drawers and closet. The rest will just get put away somewhere else for the time being and I will only use the items that are available for a specified amount of time and see how that works out (probably 1-2 months). I may start with a few more items than I think are necessary and try to make a system for rotating through them (like turning hangers around until they are worn) so I can determine if everything is getting worn on a regular basis. My hope is that I can find some success with first beginning this task with my girls’ clothing and then moving on to my own (although I feel like my wardrobe is in a constant state of change, especially with switching in maternity/summer and switching out non-maternity/winter, but that’s no excuse! I know my maternity wardrobe can be pared down, too- and I have already purged that some!). I would love and appreciate some accountability on this. If you struggle with this same thing, I’d love to hear from you. Or if you have conquered this issue or it’s something that has always come easy for you, I’d also love to hear your insight and feedback! So I’ve been doing a lot of contemplating on what to focus on for the blog and what direction it may go. I feel like God’s been working on me in many areas and I’m definitely considering sharing some of those in hopes of gaining some insight and perhaps being a source of encouragement to others. My blog and life “theme” of “living on purpose” spills over to so many facets of my life that I realize how important that is to stay focused in this area and to really be aware of that at all times. I’ve become aware recently of some practical ways that plays out in my own personal life. With the change of seasons and the undeniable return of autumn, this is a great opportunity to consider what my priorities are. Now the garden is nearly finished producing the harvest, which provides a welcomed break after a great and “fruitful” summer season! The grass is slowing in its growing. The crisp nights and mornings are a reminder that, before we know it, the cooler weather will be here to stay (at least until spring!). Never a huge fan of the long winter months, I do love the change of seasons and the beauty that each season boasts. I have always found each to display the wonderful handiwork of my Lord. So, everyone seems to have those tasks that we all enjoy and then others that we just put off for whatever reason. One of mine that I avoid is putting clean laundry away. So, I really am going to work toward tackling those clean laundry items right away, but first I am trying to figure out why I am avoiding them to begin with and I think it’s because it can be a nuisance to put them away! It’s never a quick, easy task. The reason being- there is just not enough space in our closets and drawers when everything is clean! The fact is- we usually don’t even miss most of the items when they sit in the laundry basket for a few days- okay, okay- maybe a few weeks… So, this leads to another project- more weeding out and purging! I feel like this is a never-ending cycle, but this battle must be fought!!! I would like to know what your dreaded task is and what you could do to claim the victory over it! Also, if you are already a pro at my avoided task, please share any tips you have!!! Please leave your comments below- thanks! Here’s a post that everyone should be able to at least pick up one helpful tip, if not many! Here are Money Saving Mom’s 25 Ways to Lower Your Grocery Bill Without Clipping Coupons! 5) Have a meatless night once a week (or more). Consider: breakfast foods, vegetable soup/bread, lasagna, baked ziti, bean burritos, etc. 16) Use your freezer to stock up on good deals and for batch cooking. Example: cook a big batch of chicken breasts and chop and freeze for soup, casseroles, pizza, stir-fry, taco meat, meatballs, burrito filling. Taking time to plan ahead saves time in the long run and helps resist the urge to get pizza or fast-food when in a hurry. Tip: Dedicate an hour or 2 on weekends to prep meals for the week OR make multiples of meals 1-2 nights during the week and freeze for later. – Pancakes/waffles/french toast – make a big batch and freeze! 25) Plant a garden – freeze or can extras! Whew! So there you have them! I hope you can find at least a few tips from the list that you can implement and save some of your hard-earned dough! Also, I’d love to hear what you think of this list of 25 ways to lower your grocery budget. Have you already been doing any of these things? Are you planning to do anything from the list? Do any sound totally ridiculous to you? Whew! It’s been way too long since I’ve blogged! Ick! The good news is that I was able to finish another book that I had been putting off, but that’s no excuse for this big time lapse! I did read almost 2 more chapters from The Money Saving Mom’s Budget book. There are so many tips and ideas! I will share some of them here, but again, it really is too detailed to share it all, so I will continue to recommend you read the actual book for more info. I’ve had to reset my goal of finishing this book by March 17 and my new goal is to finish it March 25. -It’s a waste of time and effort if you get 25 free cans of tomato sauce if you never do anything with it. -It is vitally important to learn how to plan a meal based on what’s on sale and what you already have on hand. -Menu-planning also saves time, effort and stress. -Plan a menu based on what’s on sale and what you have on hand. 1) Shop your cupboards (use items you already have and then you only have to pick up a few items to make a complete meal). 2) Consult the sales fliers (for deals on what you need or will use in the next few months). 3) Survey your coupons (combine with sales for even greater deals). 4) Make your final menu plan and grocery list (use a list of recipe ideas and sale items to create menu and list). -Have a recipe folder to keep recipes from magazines, newspapers, food packages, etc. ~ Take it slow and pace yourself! ~ Focus on how much you are SPENDING, not how much you are SAVING. ~ Stick to your grocery budget, even if it means passing up good deals. ~ It’s okay to take a break every now and then (shop Aldi!) so you don’t get coupon burnout! I’d love to hear your input on these coupon ideas and if you’ve had any great couponing success lately!!!! Please share in the comments!!! ~There are lots of ways to get free coupons. Her website has lots of links as well as this really awesome tool to find specific coupons! This chapter is chock full of the nuts and bolts of couponing and lots of tips, even for someone such as I who have been using coupons for as long as I can remember, thanks for my mom teaching me their value from a young age. 🙂 I won’t go into the nitty gritty, but basically please know that you can find lots of info in the book, as well as links to some great coupon websites as resources. She also goes into detail about a few filing systems to choose from for keeping your coupons organized. This is something I need to crack down on and be disciplined about keeping organized. I’ve gotten some good ideas I plan to implement. Also, she mentions sending expired coupons to military to use. Does anyone do this? I’d like to send mine for someone to use. So Crystal’s suggestion is to do this for 3 months. She’s talking no credit cards, no debit cards. No plastic at all. Yes, this may seem very drastic to some. To me, honestly, it would feel next to impossible. Or at least very difficult- even just thinking about it is sort of scary for me!! Maybe just the change it would involve is the cause of my trepidation. I would venture to say that many of us have taken advantage of the ease of using a credit or debit card, even if we pay the credit card in full when the bill comes due. Sometimes I do like to do scary things. I know that usually in the end, the result will make the fear it caused well worth it. So, I will soon be taking the plunge on this one. <GULP> Planning to begin in April and taking the month of March to prepare. Our Money Saving Mom says one of the main reasons to give up the plastic is that plastic gives you something to fall back on. “Just this one time.” or “Just until payday.” It gives a false sense of security and the opportunity to cheat on your budget when temptation arises. 1) Cut up, freeze or otherwise completely remove the ability to use all credit or debit cards for the next 3 months. 2) Make sure you have created the Full-Fledged Budget. This must be done first. 3) Determine which categories from Full-Fledged Budget will be paid from cash envelopes and which will be paid by direct withdrawal or check. Use cash for as many as possible. 4) Divide up paycheck immediately. Deposit enough money in checking account to cover all monthly payments paid by check or auto withdrawal. Withdrawal in cash the total amount needed for cash envelopes and divide accordingly. 5) Bring only the cash envelopes and calculator with you when you shop. Do a quick estimate on how much the items on your shopping list should cost. Bring this amount and a little extra (she recommends $5-$10 extra). 6) Calculate purchases as you add them to your cart. This motivates you to evaluate each item carefully, being aware of the cost, looking for the best deals, and prevents you from having to put items back at check-out. 7) For online purchases – use PayPal, prepaid cards or giftcards. Take cash from cash envelope and deposit into bank account ASAP. 8) Any extra budgeted money in category or cash envelope should be saved and rolled into next month. This gives some wiggle room. ~ Q: What if I find a good deal but I don’t have the cash on hand? A: Use “extra” cash or skip another item in order to buy it. Otherwise, do not buy it. She is not “anti-credit card,” although she has never had one. She does, however, warn of the dangers and feels strongly that credit cards can only be appropriately used by someone with extreme self-discipline and a strict budget already in place. There are several other credit-related issues addressed in the book, but I’d rather not go into too much detail here. I’m trying to just give an overview and bring you along on my journey. I’ve been hard at work re-vamping and adjusting our budget. I think I’ve actually been able to simplify the Excel spreadsheet that I have been currently using, thanks to some of the information and tips I read in the book. I’m really excited to get our budget a little more “full-fledged” and functional. This will be a work-in-progress, since budgets can vary from month to month and normal tweaking typically needs to be done. I have to say that this chapter has been the hardest for me to swallow so far. It’s caused me to be convicted to make an uncomfortable, but necessary change. I know it will be worth it, but it will not be easy! I’m excited to see where this journey takes my family!!! She says this proven method to give yourself a raise without actually MAKING more money is called a BUDGET. Crystal says a budget is for ANYONE, especially those barely keeping their heads above water. I have to say that budgeting is something I am very familiar with, so I was going to just skim this chapter, but honestly, I have found there is a lot to learn, even for someone who already has a budget set up. I have found ways to SIMPLIFY our budget and also ways to be held accountable. She talks about doing the THREE MONTH CHALLENGE. Once again, I love how she is so realistic and practical and all about taking BABY STEPS and doing things in bite-sized pieces, in order to have greater long-term success. She suggests starting small (especially for first time budgeters) and taking THREE MONTHS to “ease in” to the whole budget thing. She considers this one of the greatest areas to cut down expenditures significantly. To determine your grocery budget, look back over grocery expenses for the last few months and average out the weekly amounts. Multiply by 4 to get the monthly budget to start with. Withdraw the full monthly amount for grocery budget in cash for the month and put in an envelope. Take the weekly allotment to the store each week. ~ You can’t go over-budget. When it’s gone, it’s GONE! **Don’t be alarmed if the first month of this is really a struggle. It takes time and practice. If it’s not working after a few months, it may need to be adjusted. One great tip she talks about is to figure out how much your actual MONTHLY expenses are, even if a particular bill is not paid monthly. For example, under utilities is “trash”. My trash bill is due quarterly. So, I would take that quarterly bill and divide it by 3 months and then set aside that amount each month (she recommends a separate checking account). Then, when the bills comes, that money is already available and budgeted for the trash bill. No big surprises, etc. It’s basically what your mortgage company does for you if you have an escrow account set up through them. Every month, part of your payment goes into an account so that when your real estate taxes and insurance premiums are due, the money is already there. It’s such a simple thing to do but I have to admit that I had to learn this the hard way several years ago. I got so tired of the semi-annual bills coming and “surprising” me, that I finally decided to start putting aside the amount needed each month so that it was there when the bill came and didn’t have to eat into the budget for when it was due. Make sense? It’s made a world of difference for us! This takes the bare-bones budget to a whole new level and includes every area where money could go. This is awesome. Honestly, some people may at first see a budget as being too restrictive, but it really tells your money where to go, and allows you to control your money, instead of the other way around. It is actually quite freeing to know where it’s all going and to be able to manage it. For more details on setting up this complete budget, along with lots of tips on how to allocate amounts, cut expenses, etc, consult the book. There is great, concise information that is very easy to understand and simple to implement. Now I will be using these tips to simplify my own budget and get it on track! Would love to hear any tips from you relating to your budget experience. If you are setting one up for the first time, or the second time, etc, then GOOD FOR YOU!!! Please share and insights you may have! What I’m loving about this book is that, even though it all really “revolves” around finances, it ties in so many other aspects of life that affect one another. Yes, all of the different areas she addresses affect finances, in one way or another, whether directly or indirectly, but they do not ONLY affect finances, so there is much to be learned, no matter what we are trying to achieve. So, this is something I can relate to. My confession is that there are definitely many negatives as a result of my “chaos and clutter.” While I can say that finance issues are not a big problem, my chaos/clutter/disorganization does indeed cause other issues, such as stealing the potential for more peace and simplicity, as well as saving time, sanity, patience and having more tolerance! I can, however, definitely recall a few times that I’ve gotten myself into trouble (money-wise) and not to mention additional stress, due to being cluttered and disorganized (and KNOWING I had a coupon for that item, but having NO IDEA where it got to- which pile/bag it got in, misplacing or forgetting about a bill, etc.). Soooo frustrating! So, of course, I’m open to any help I can get here! Crystal encourages us to GET OUR LIFE IN ORDER! The key points here are that being disorganized makes us waste time -looking for things, not knowing what we have (and ending up buying duplicates, etc), and MORE! BECOME THE MASTER OF YOUR MINUTES. It’s about eliminating our PERSONAL CLUTTER. RESTRUCTURE priorities to make time to get finances in order. I can’t stand that feeling! When I DO something, I want to give it all I’ve got and do it to the best of my ability. If I know that I can’t give it 100%, then I either need to say NO or give up something else. When we say YES to one thing, we say NO to another. 1) STOP trying to DO IT ALL! – It’s OK to say NO! We’ll be BUSY, but not really make any MEASURABLE PROGRESS. When setting up a time-budget, start with the 24 hours that we all have in a day. ***Has anyone actually ever done a time-budget or even a time diary type thing to see where all of their time goes?? I’m still working on this time-budget that Crystal describes, but I know in the past when I’ve done a time diary, it is AMAZING to me to see 1) where all of my time goes and 2) how it keeps you accountable when you know you have to write it all down! For more in-depth details about this time-budget thing, please send me a message or consult the book. – Home and life can’t be in shambles if we want to get finances in order. These really do go hand-in-hand. ***I’ve found that a lot of these types of ideas for getting organized need to be what works FOR YOU. I would suggest taking a look around and determining what your clutter problems are and where they come from. For example, if it’s papers, then it probably has a lot to do with the mail, etc. A simple accordion file case or individual file folders like I had suggested in a prior post would help you to tame that problem. It will also take self-discipline to MAKE A HABIT to use the system, but having a PLACE for the items and a SYSTEM, will be half the battle!! If you have a particular thing or area that is causing you trouble, I’d be happy to try to come up with suggestions to kick the problem on its rear. Or feel free to post a comment and we could see if anyone else wants to chime in with suggestions! Well, that’s it for Chapter 2. Next up is Chapter 3 (imagine that), which addresses BUDGETS!!!! !